Directional Control Valve Model SS | Cross Mfg. The Cross series SS directional hydraulic control valve offers extremely low leakage with exceptional load holding ability in a small, yet rugged, sectional valve. A single section may be utilized by itself or stacked in a series to perform multiple functions giving this valve a unique versatility. Solenoid as well as manual actuators are available. It is compact, yet large enough to accommodate quick disconnect fittings. 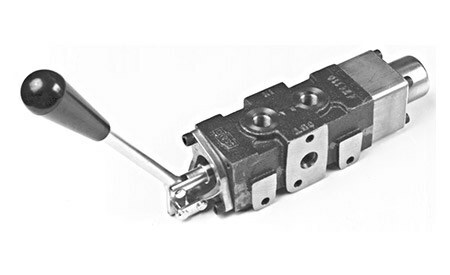 This hydraulic directional control valve offers unique versatility in a compact, yet rugged valve with extremely low leakage and exceptional load holding capability. Each section incorporates threaded "in" and "out" ports so it may be utilized alone ... or stacked for multiple functions. It is large enough to accommodate quick disconnect fittings in the ports and an inlet relief section may be added when required. The SS is ideally suited to the landscape grooming and lawn and garden industries as well as the expanding mobile market. *SSC must be specified for the last section in a stack when Inlet Relief section is used. For tie rods, tie rod nuts, and required o-rings, see SS Series parts or price sheet. Additional spool and actuator options are available.